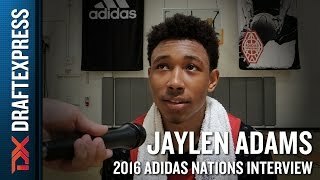 Jaylen Adams, the junior guard out of St. Bonaventure, put together a solid showing at the Adidas Nations, leading the tournaments in assists per game at 3.4 and finishing second in steals at 2.4. Adams is coming off an impressive sophomore season in which he finished eighth in the A-10 in scoring, and 2nd in assists. At 6'2, 185 pounds Adams has good size for the Point Guard position. He showed some adeptness playing out of the pick and roll, looking comfortable making the pocket pass, or stringing the defense out and making patient decisions. He is not the quickest guy, but he uses his size well to get into the paint and make drive and kick plays, or look for contact around the rim. He'll look to make the extra pass, and did a good job making the kick ahead pass in transition. He has some catch and shoot ability as he hit 43% last season on 6.4 attempts per game, but his release is slow and flat footed, especially on his dribble jumper. He is capable of hitting some tough shots, but he'll have to make some adjustments on his release when he is consistently playing against more length and athletic ability outside of the A-10. Adams uses his size well on the defensive end of the floor, getting into the ball and forcing ball handlers to make tough decisions. The Adidas Nations was a new setting for Adams, and that showed at times. In stretches he looked passive and uncomfortable against the competition, and at times he drifted into taking some bad shots, as evidenced by his poor field goal percentage. He has shown what he is capable of at the A-10 level, but he is going to need to show that he can perform at that same high level consistently against more advanced competition, as he sets his sights on the pro game. Adams is not the most athletic guard you'll find, but this was a good experience for him and one that will likely help him going into his junior season.